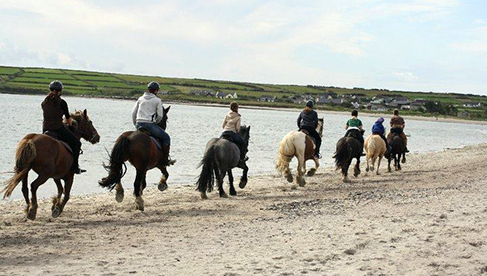 Long’s Horse Riding & Pony Trekking is a family-run centre located in Ventry Village on the Dingle Peninsula in County Kerry. 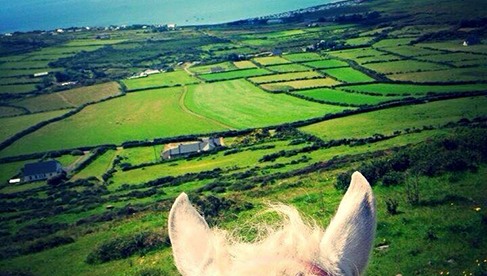 Whether you are a beginner rider or have years of experience, Long's Horse Riding has treks and horses to fit your needs and riding holiday desires. The stables offer a wide range of equestrian vacations covering a variety of areas and for different periods of time, so you can do as little or as much as you like! 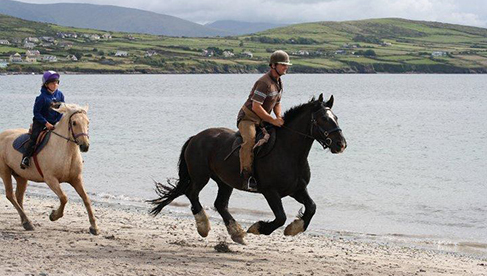 It’s every horse lover's dream to gallop through the surf, and Long's Riding Vacations, run by longtime horseman John Pat Long, can give you that chance with their popular beach rides. Ride for one hour or three days or more, trekking into the mountains or bounding through the surf on the beach. 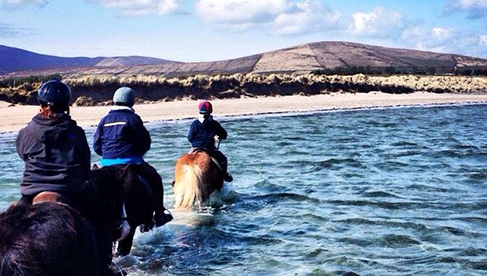 Enjoy views over Ventry Bay, Dingle Harbour and Mount Brandon or trek over Mount Eagle, viewing the Blasket Islands. 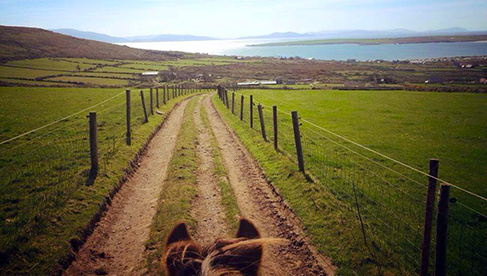 Movie buffs may know the stunning Dingle Peninsula as the site of David Lean's 1970 film Ryan's Daughter, which takes place at a village on the Dingle Peninsula and the more recent movie Leap Year is partly set in the Dingle Peninsula. 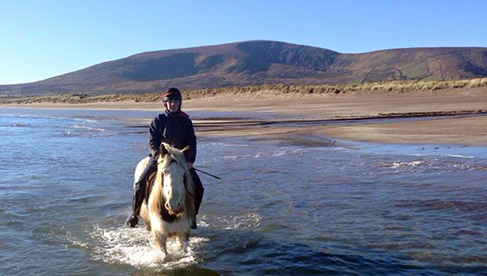 3 Day Trail Riding Vacations- Enjoy the Dingle Peninsula on horseback, from Dunquin to Brandon Bay, an almost 12 mile (19.3 km) beach at the foot of Ireland’s second highest mountain. Starting at $163 USD* (€150) per day. Guests stay in a variety of accommodations, including Self-Catering, Bed & Breakfast, Farmhouse's and a 4-Star Hotels. 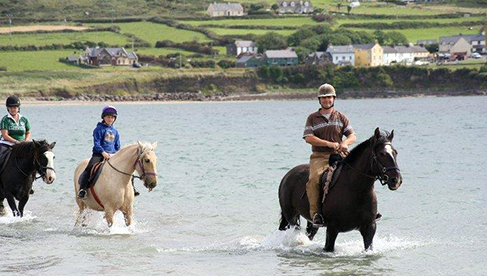 Ireland horseback riding vacations on the Dingle Peninsula including horseback riding on the beach and mountain trails. Join Longs RIding Centre for one hour, three days or more. Ventry is situated in the most beautiful corner of Ireland's south-west, within easy reach of Swansea-Cork Ferries and Kerry Airport.